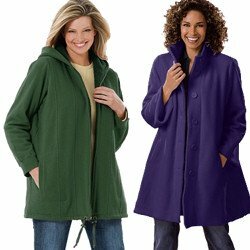 Plus Size Sweater Coats make a fabulous fashion statement, are a great alternative when it is not cold enough to wear a heavier coat or in milder climates. After being very scarce for several years, sweater coats are making a big comeback this season, with more choices than ever. Are you sick to death of wearing clothing that looks like a sofa cover? You’re not alone. Just because you’re a curvy woman doesn’t mean you have to make due with shapeless clothing including sweater coats. You just have to find garments that have the best tailoring for your body while distracting the eye away from problematic areas. Let’s take an example. Let’s say you’re short but still wear a plus size. The temptation is getting a long sweater coat, but the resulting look actually shrinks your stature. The best plus size sweater coat for your body is one that stops at the hip. Leave the long sweaters to taller gals. Another illustration is for women who don’t have well defined bust to hip lines. You need help getting those curves in. 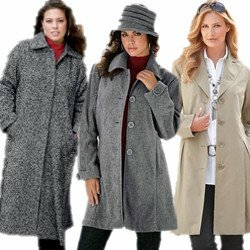 One way to do it is by choosing a plus size sweater coat that has a belt or tie. It’s a little touch but it really goes a long way toward creating the desired look. An alternative is taking a cue from the short-statured plus gal and getting a sweater coat that stops at your waste. Ok, so what if your body isn’t either one of these types? No worries there are ways to choose your sweater coat accordingly. A woman with serious curves can reach to a wrap-style sweater with a V or U-shaped neckline. You can also go with the hip length sweater to emphasize your curves. Embrace them! By comparison the full-hipped woman should go for dark colors and sweaters that don’t cling to your body. One way to pull attention away from your bottom is looking to styles with collars or decorative touches around the neckline. Simple and comfortable. A lot of women carry their weight in their stomach, making their waist disappear. Like the full-hipped woman, reach for the sweater coat that either has a decorative neckline or a collar. If you can find one in a classic A-line, all the better for overall balance. The woman with a fuller bust may struggle with finding the right plus size sweater coat, but there is a solution for you too. Again stick with darker hues and try to find a sweater that allows you to define your waste or hips, drawing the eye downward. It is absolutely unnecessary to hide your bust. A line sweaters work for you too. Sweater coats make an excellent addition to any wardrobe. Just take your time and shop around. The plus size world has grown tremendously in recent years. You won’t be stuck with a “whatever” shrug. Just use these basic guidelines and you’ll buy a fabulous sweater coat perfect for your body.